No details are available of this single-seat biplane, which arrived at Salisbury Plain early in January 1911. The power plant was a 60hp eight-cylinder air-cooled motor of X-form made by the Nonpareil Fitting Co. of Birmingham. The machine made a number of short straight flights only by the end of January in the hands of the owner. There were no further reports. 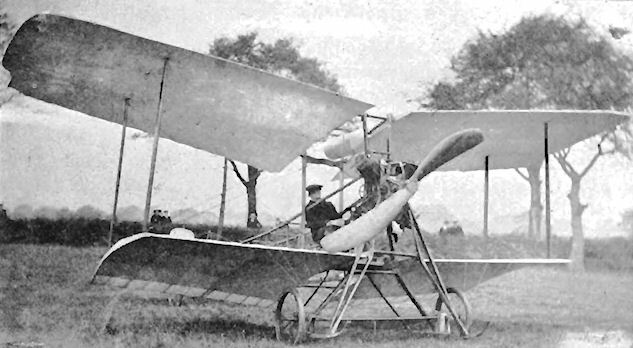 The single-seat Carter Biplane was built during 1910, and tested on Salisbury Plain in January, 1911. The engine was an eight-cylinder 60 h.p. Nonpareil made by the Nonpareil Fitting Co. of Birmingham. Mr. Carter was out on the new machine which arrived about a fortnight ago, and with the engine running fairly well, the machine made a few hops. From the accompanying photographs it will be noticed that the machine is of the biplane type of very short span, with the upper planes of slightly greater span than the lower ones. There is no elevator in front, but that position is occupied by the engine and propeller. The engine is an 8-cyl. one, made by the Nonpareil Motor Fitting Co. at Birmingham. At present it gives about 60-h.p., but when properly tuned up it is expected to reach about 80-h.p. On the following day Mr.Carter was out again, and succeded in getting the biplane off the ground for short distances. Mr. Carter was also out with his biplane after having made a few alterations to the tail. The machine rises very rapidly, in one case getting off the ground in 15 ft. but no extended flights were made owing to the fact that the engine was not running up to form. The biplane, with which Mr. Carter has been experimenting at Salisbury Plain during the last fortnight, as seen from in front. View from the rear of Mr. Carter's novel biplane.